Under Windows 10, Quick Text Paste must be started in the administrative mode to send the commands to administrative programs! For this reason, this new option to start Quick Text paste directly from the program in administrative mode! (Image-1) Run in Admin-Mode from Task-Bar! (Image-2) Run with Administrative Privileges Quick Text Paste! 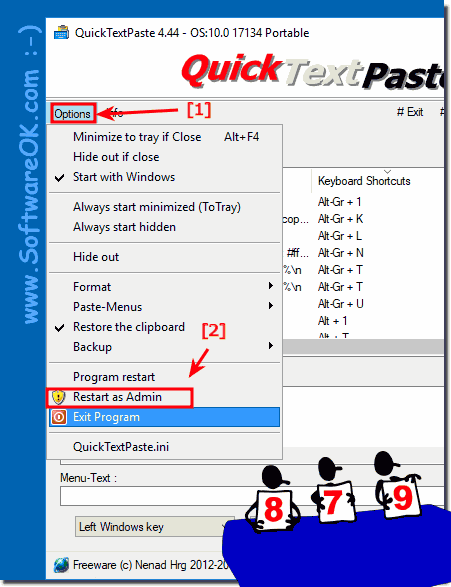 QuickTextPaste - FAQ-33: Problem keyboard shortcuts commands in Windows 10 to insert text?